Physically, Bhutan can be divided into three zones: Alpine Zone (4000m and above) with no forest cover; the Temperate Zone (2000 to 4000m) with conifer or broadleaf forests; and the Subtropical Zone (150m to 2000m) with Tropical or Subtropical vegetation. Forest types in Bhutan are Fir Forest, Mixed Conifer Forest, Blue Pine Forest, Chirpine Forest, Broadleaf mixed with Conifer, Upland Hardwood Forest, Lowland Hardwood Forest, and Tropical Lowland Forests. 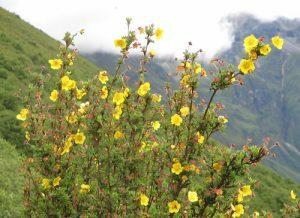 300 species of medicinal plants and about 46 species of rhododendrons can be found in Bhutan. A wide range of animal are also found frequenting the jungles of Bhutan. Some high altitude species are snow leopards, Bengal tigers that are found at the altitude ranging between 3000 to 4000 meters besides red panda, gorals, langurs, Himalayan black bear, sambars, wild pigs,barking deer, blue sheep and musk deer. In the tropical forests of Southern Bhutan one can come across clouded leopards,one horned rhinoceros, elephants, golden langur that is unique to Bhutan, water buffaloes and swamp deer. Bhutan also has a great variety of bird species. The recorded number of bird species is over 670 and there are chances that this number could still go up. Bhutan is also home to about 16 bird species that are in endangered list worldwide. These include White bellied heron, Pallas Fish eagle, Blyth’s King fisher to name a few of them. Phobjikha valley in Wangdue Phodrang and Bomdeling in Trashi Yangtse are also two important places in Bhutan that is visited by the endangered Black Necked Cranes every year.